For over 30 years, Pink Dot has been delivering whatever grocery store items we need directly to us—from sandwiches and snacks to booze, smokes and even condoms. They like to think of themselves as “room service for your home”. Well, that room service has recently stepped up its game with the offering of craft cocktail kits available on-demand. 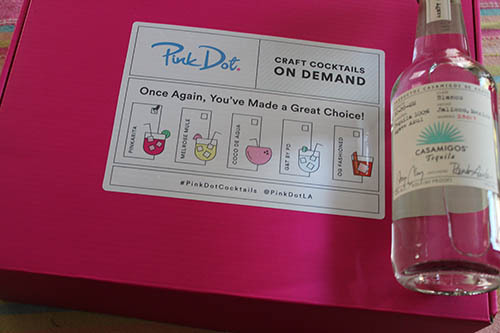 Pink Dot is now letting you be the at-home bartender with its Craft Cocktails-On-Demand kit. Delivered directly to you will be a complete kit with all the ingredients you will need to build your own specialty cocktail—delivered straight to your door. 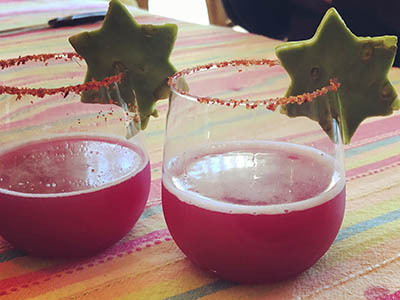 The inaugural Pink Dot cocktail is the “Pinkarita”. In fact, Pink Dot is so committed to using their launch to raise awareness to defending and advancing the rights of low-income immigrants that $1 of every purchase will be donated to the National Immigration Law Center. 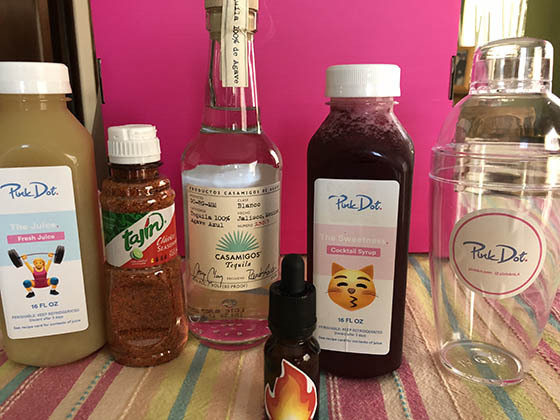 For $40, the basic kit includes fresh lime juice; fresh prickly pear cocktail syrup; firewater bitters and cactus garnish; along with Tajin chili salt, napkins and straws, as well as a recipe card and measuring cup. Add-ons include a 7lb bag of ice for $5; cocktail shaker for $5 (very useful if you don’t already have one); Tossware cups, and limes. If you need a bottle of tequila, that can run you $30 or more depending on what brand you prefer. With all my essential ingredients in front of me, it was time to get cracking and make cocktails. The directions were very easy to follow and in no time, I had several solid and spicy “Pinkarita” drinks for my whole party. The fact that the fresh lime juice and fresh prickly pear cocktail syrup were included in the kit made things really easy and took the drink up a notch from the simple cocktail you’d make at home otherwise. The Tajin chili salt was another nice touch, as was the cool cactus garnish. The ingredients were fresh and the directions simple to follow. No blender necessary as the resulting margaritas were spicy, savory and served on the rocks. They went over so well and were a favorite of the night. Simple and solid cocktails…now I’ll drink to that. Click here to buy the Pinkarita cocktail kit.